Super easy, healthy, creamy and delicious gluten-free & vegan coconut butter a.k.a. coconut manna made with only 1 ingredient! If you've never had coconut butter before, then you are in for a real treat! If you have and you are put off by the high price in stores, then you will be very happy to see how economical & easy it is to make for yourself. Coconut butter (also known as 'manna') is a delicious and healthy spread that can serve many uses. It is healthy and delicious as it is by the spoonful. It works great as a replacement for regular butter or spreads on toast and crackers. Coconut butter makes an excellent frosting for baked goods and desserts. Freeze it for a healthy treat. Drizzle on pancakes and waffles. Stir into warm beverages as an extra creamy and delicious ‘creamer’. Stir into soups and curries for extra creaminess. Use coconut butter instead of oil for stir-fries and to saute vegetables. 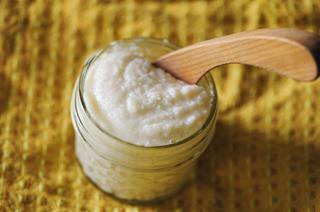 Coconut butter is also great for skin and hair as moisturizer. You will find numerous ways to incorporate this tasty & magical butter! It contains lauric acid which helps boost immunity. It is filled with metabolism-boosting healthy fats. It is a high-fiber food. It is filled with anti-bacterial properties. It contains a healthy dose of iron, manganese, magnesium, calcium and B vitamins. Super easy, healthy, creamy and delicious gluten-free & vegan coconut butter (also known as 'manna')! In a food processor or high speed blender, blend shredded coconut for 10-15 minutes whilst scraping down sides with a spatula every few minutes until you have a satisfactory creamy consistency.Store at room temperature in a jar with a tightly fitting lid (keeps for a month or so). It is normal for the oil to separate, just stir before use.Enjoy!